I ran out to the hive and looked at the bees buzzing around the entrance. I could see that some of the bees were fanning, which means only one thing…The Hive Is Being Disturbed! Sure enough, at that moment I saw something yellow streak into the mass of bees at the hive entrance and grab a bee. It was a yellow jacket. There were yellow jackets attacking the beehive and eating honeybees! The honeybees fought back bravely. I saw two or three bees attacking one yellow jacket. They rolled around on the ground in a ball, trying to sting each other…a battle to the death. Then, another yellow jacket joined the fight and started to sting the honeybees. Sadly, it was all over for the honeybees in that skirmish. Two yellow jackets against two honeybees is certain death for the bees. But, in this case it was also curtains for the yellow jackets. I squished them with my boots. For the next five minutes, I stomped on yellow jackets. I must have killed twenty or more. The dying yellow jackets emit a scent which draws other yellow jackets to the fray. I had a regular stompfest there in front of my beehive. After a while, the beehive settled down, and peace once again reigned in the kingdom of Apis. The bees returned to gathering nectar and pollen and I returned to my other tasks of the day. Since then, I have been watching my hives more closely than before…still wary of the lurking yellow predators who want to eat my bees. 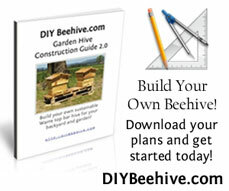 This entry was posted in Beekeeping Advice, Nick's Bees and tagged beehives, honeybees, insect battle, yellow jackets. Bookmark the permalink. My hive is currently experience a yellow jacket invasion. I have killed dozens but they still keep coming. I put the bee excluder in the entrance with the smallest opening available to assist the bees to guard the entrance. Any other suggestions on getting rid of the yellow jackets? Greg – That is about all you can do. You can try to trace the yellow jackets back to the yellow jacket nest. Once you find their nest, you can destroy it. Other than that, there is not much more one can do to help the bees in the battle. I had the same issue two years ago with my hives in Wilton California. The yellowjackets actually attacked the hive and robbed it of much honey. I had not looked at the hive for about 2 months and when I saw it the bees where out of the hive except for a few frozen bees. I found about 20 yellowjackets nesting in the hive. Of course I killed them quite easily since it was cold. That was the last time I was going to allow that. Since then I usually narrow the hive. That reminds me I better narrow the hives this week. Paul – Wow. That is sad. Yellow jackets are nasty! Like you mentioned, minimizing the beehive opening is the best method to combat yellow jacket attacks. I have a topbar hive in town. We have quite a few yellow jackets around. I use a hornet trap near my hive. I took a quart jar, drilled a few 1/4 inch holes in the lid, and put in a cup of water with a couple tablespoons of jelly. The bees aren’t interested. When the hornets come looking around the hive, they become attracted to the trap, and drown themselves. my bees have been under attack by some unadetafied large looking flee not any kind of mite one hive has left about 20’00.00 bees I have one hive left. About 5000.00 I need help .I have battled all other pest and won. Sounds like you may have hive beetles.. You can check with your county or state beekeeping authority and they will come out and inspect it and then offer some suggestions as to what you should do to re-mediate it. 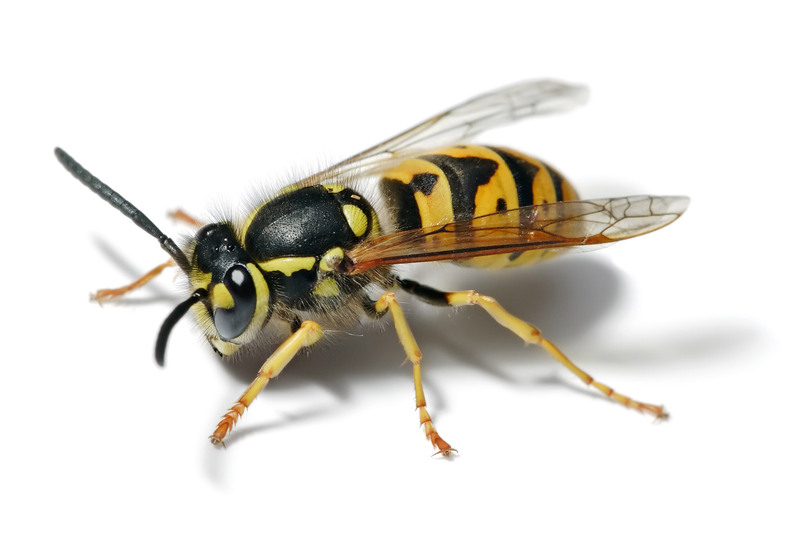 For your information, the Yellow Jacket or Genus Vespula shown on picture is a WASP, not a bee. The best thing to help protect your bee hive is always check it every day or so!! The bees wont mind you looking around the hive a few times a day. Inspecting the hive will help prevent some hive beatles. Also if your a bee lover and you want your hive to do well, also just watching it every now and than and looking around your yard will prevent other attacks from yellow jackets and prevent many threats from your hive!!! Thank you so much for this post. I was working on a children’s story, and I couldn’t remember if yellow jackets attacked bee hives. This answered all my questions plus gave me a great resourse for my father who has been interested in bee keeping. Looking forward to showing him this site. Today is a cool, cloudy day near Portland, Oregon so I was not concerned when there was not much activity near my hive. But when I looked closer there were no guard bees and every three minutes or so a yellow Jacket would fly in, spend about 20 seconds doing who knows what havoc, then leave. Every once in a while a lone bee would fly out. Thanks for your posts, I will narrow the entry right away and look for the Yellow Jacket nest. Please let me know if anyone has had luck with the trap Chuck made. I’ve had this problem before. I took coarse window screen and made a reducer for the hive opening (in the hive I kept in high school.) The paper wasps and ground hornets were stymied by the 2 bee sized opening, and the workers could still fan to vent the hive in our extreme Texas summer. The wasps ran up and down the landing board trying to find the opening and were easily repelled by the workers. StoneMaven, can you post a sketch of that somewhere? I just opened my hive here in Middle Tennessee. No brood, not much honey, and I didn’t see the queen. I was checking for brood and saw a yellow jacket in there! I went back out with some needle nose pliars to kill him. He was gone. We are in a drought right now. I just put my feeder box on top to start feeding the girls. I plopped a banana on the landing pad for food also. Guess I need to head to Lowe’s to get some traps. I have a similar situation. I picked up a prime swarm about a week ago out of an oak tree. I installed them in a new warre hive. I’m at work the next day to see Robing activity outside my previous to establish hives The previous hives are carniolan bees. I’m not sure what to do. I tried robbing screen on the two hives for 2 days. The robbers just piled onto the screen and eventually found the one bee width space and fight there way in. I now have completely close the hives and wrap them in wet sheets. The Robinng bees are still all over my carniolan hives. Just piled onto the sheets for two days now. Advice? Take the top off the robber hive. It will stress them out and keep them busy. So says my wife who is pretty smartabout theses things. I am a lavender farmer in Missoula and have been fiercely defending the honey bees and sweet, ground dwelling, native bees from these horrible monsters! Stomp fest i guess! I note the large black hornet also preys in the pollinators. I have never noticed this before, and can’t believe there could be more trouble for the sweet bees. I bought those fake paper wasp nests you can get in hardware and dollar stores and hung them in the beeyard. The idea is that real wasps will see the fake nest, and decide to start their nests elsewhere, as wasps are territorial. I think the fake nests do help, but narrowed entrances in late summer after the nectar flows slow is also standard practice. I have been told using pheromone traps very early in the year, when the new queens are out and about, can help as well. You’ll probably want the traps a good ways away from the hives. No sense drawing them closer. exactly traps can and do draw them in closer to the hives you are trying to protect just like Japanese beetle traps do best to keep them farther away especially if your hives are not under attack right now. maybe a bit closer if they are already being attacked to try to draw them away from the hives and then move them farther once the Hornets start going to the traps. “As wasps feed on both protein and sugar, two types of water traps can be used. Trapping wasps needs to be initiated in the spring when queens emerge from their nests in search of protein. Trapping them during this period has the potential to provide an overall reduction in the population for the season. In fall, more traps may be necessary to trap scavenging wasps looking for large amounts of sugar to maintain the queen and workers. She also give a sugar trap design but I would not recommend that with Honey bees as you might trap more bees than wasps and hornets. Here are some other resources that might prove helpful in building hornet traps. Good hornet hunting! !